I quite possibly just made the most hideous buttonhole. Just in case you wanted to know what was going on in real time Katy sewing. Also! I now have the "Name my serger" poll up on the side. I omitted names that were similar to another as well as those I know personally. Yes, I have an Uncle named Knute and don't know that he'd appreciate having an inanimate object named after him. Open until Sunday, so you have time to be contemplative. This is a huge decision. Here it is! How to make a cut out! This technique works with an type of fabric, and I've actually got another project in the works using this technique. It's kind of strange that it makes me so giddy to make a hole in my fabric, you? I actually tried to convince Clover first that her swimsuit would be really cool with a hole in it and the thought of it almost brought her to tears, so I did it with Azure's more slender body type with a smaller hole ;). ➀ Draw a circle on your lining, centered or not. Whatever look you're going for. ➁ Stitch the circle. Go slowly, pivoting your fabric on the needle frequently to stay on the line. Cut circle out 3/8" from edge and clip. ➃ Stitch around circle. 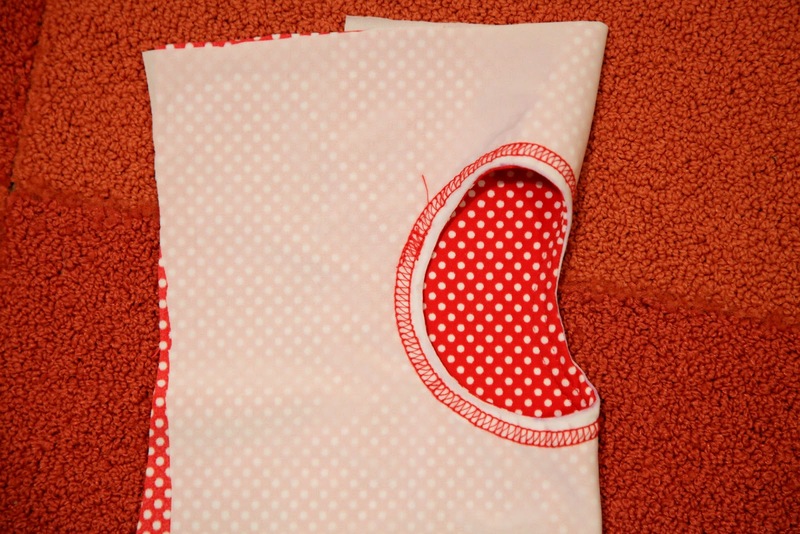 If you're using stretchy fabric, you will want a stitch that accommodates the stretch. Voila. Go make holes in your projects. And be hole-y. (I couldn't resist.) Also, please excuse any unclipped threads you might see in these photos. How funny, my step-brother's name is Knute! I never thought I'd ever hear of another one! Love the tutorial too. I wondered how you did this, the bathing suits look great! Your girls are so adorable!! Off to cut holes in my fabric!!! Did you use your serger w/out the knife to do the topstitching around the circle, or is that a fancy stitch with a double needle? Also, if you don't pick Sergei for your serger name, I might have to steal it, that's a fantastic name, kudos to whoever thought of that!! One of these summers I will attempt to make Abby a suit, but I'm sure it will not turn out as fabulous as yours do! This is adorable! I hope you are well, friend! What kind of Serger do you have? That top stitching you did around your circle is something I've been wanting to learn, but have no idea how to on my serger. You should do a serging 101 series so I can learn how to use my dang machine! Love this tutorial but also not sure how you did the top stitch ? I usually use a double needle on my sewing machine for stretch finish but it's not so pretty on the inside. I could do with the whole "make a swim suit tutorial " like the straps , the pattern etc. Ooh, so cool! That looks like a coverstitch to me, so I am guessing your presently nameless serger can do that. (For some reason Lydia jumps out at me as a name but I see I am in the minority.) I am in awe of your masterful control, stitching around that circle! I can see the question has already been asked but to let you know we are at least TWO who would like to know: what serger do you have? Would love to have a serger that can sew coverlock as well. That would make all sewing in knit fabric so much easier. Everyone else--I have a Bernina 1300 mdc which is a coverstitch machine as well as an overlock (serger). There are machines that do one or the other and then there are ones that can convert. I am by no means an expert, since this is my first experience using one, but I have enjoyed learning. My previous swimsuits were made entirely with double needles, and that worked just fine...perhaps not as pretty on the inside, but nonetheless fine. The machine with both functions is nice, but you do have to take the time to switch between functions and the different threading, but you also don't have to have 2 machines sitting out. It's a toss up. Craftysquirrel--I have two other swimsuit tutorials that show how I go about making a swimsuit with no pattern in my tutorial tab. Hayley--I don't feel I know enough to do a serger 101 series of posts, yet. Maybe down the line when I've learned more, but not yet. 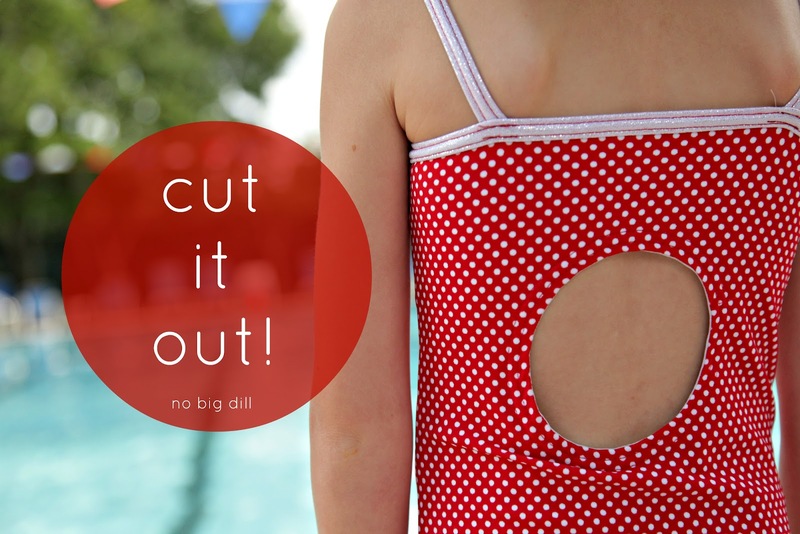 For what it's worth re- the holes-in-projects, for a very stretchy fabric that is going to be under a lot of tension, like a swimsuit, had you thought of laying a piece of thin, clear elastic (maybe 3mm wide) at Step 2 as you stitch? Probably difficult to get a nice curve after turning the lining under with such a small decorative hole, but sometimes the extra 'guff' that a tiny piece of elastic to reinforce provides, allows a bit more latitude for a suit that gives to put on, but still recovers its stretch when on, to provide a close fit.